If you have pressure from deer and rabbits, take a few steps to protect your plants from damage now and through winter. 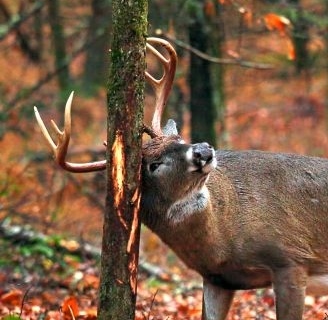 A buck rubbing velvet off his antlers can kill your tree. Buck rubbing can happen any time now. Protect tree by using trunk protecting tubes, always in the color white. Tubes can’t protect the entire tree so we also suggest you use animal repellent sprays like Bonide Repels All or Liquid Fence on your plants to discourage deer activity near them. These sprays do not harm your plants or the animals and are made of natural ingredients. We have white tree trunk protectors and the sprays. Rabbit and deer browsing on trees and shrubs can be frustrating. An excellent line of defense is to start now and spray on several layers of animal repellent between now and winter. These sprays work best when they dry on, rather than freezing on. We also carry Bonide Repels all in granular form which can be used in winter on snow. Fencing around “tasty” plants is also helpful. If you have problems with mice….. The product show below, Mouse Magic, is very effective in closed spaces. Use it to prevent mice from entering rooms, drawers, cars and so on. It too is all natural and won’t harm you or the animals.